Background & Objective: The link between Zika Virus (ZIKV) epidemic and neurological disorder has raised an urgent global alarm. The current epidemic of ZIKV has triggered quick responses in the scientific world. The first case of ZIKV was reported in 2015 from Brazil and now has spread over 30 countries. Nearly four hundred cases of traveler associated ZIKV infection have also been reported in the United States. ZIKV is primarily transmitted by mosquito belonging to the genus Aedes that are widely distributed throughout the world. Additionally, the virus can also be transmitted from male to female by sexual contact. The epidemiological investigations during the current outbreak found a causal link between infection in pregnant women and the development of microcephaly (MCPH) in their unborn babies. This finding is a cause of grave concern since MCPH is a serious neural developmental disorder that can lead to significant post-natal developmental abnormalities and disabilities. 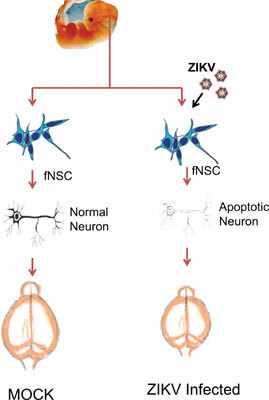 Recently, published data indicates that ZIKV infection severely affects the growth of fetal neural progenitor cells and cerebral neurons resulting in malformation of cerebral cortex leading to MCPH. Recently, it has been reported that ZIKV infection deregulates the signaling pathway of neuronal cell and inhibits the neurogenesis. Conclusion: In this review, we discussed the information about cellular and molecular mechanisms of neurodegeneration of human neuronal cells and inhibition of neurogenesis. The provided information in this review will be very useful further not only in neuro-scientific research but also in the desig and development of management strategies for MCPH and other mosquito-borne diseases. Zika virus, neurodegeneration, microcephaly, neuroprogenitor cells, mosquitoes, infection.